At the time of this writing, March 2018, this shampoo is Number One in our Top 10 List of Best Selling Shampoos for Hair Loss. 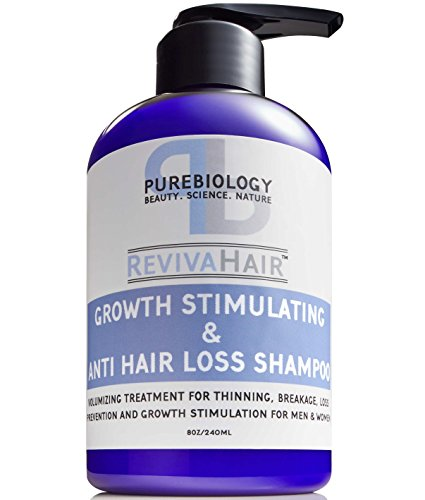 This Hair Growth Stimulating Shampoo is a new product by PureBiology. The reason why we are taking a closer is because this product literally came out of the blue and flew up the ranks on Amazon. It has bypassed other well-known hair loss/hair growth shampoos and has claimed the Number One spot, for the time being. As you may know, we have a list of key beneficial ingredients that we frequently refer to on our other blog: HairLossHelpOnline.com. Our key ingredients include those that minimize or stop the production of DHT, the hormone that actually causes hair to fall out. We also look for other key ingredients that nourish and stimulate hair follicles, strengthen the hair shaft, and stimulate the scalp and the production of hair. We also look for any other ingredients that may not be beneficial especially if you do shampoo daily and/or color your hair. Here is our Key Ingredient Chart, below. If this shampoo checks off all of our requirements, we will not hesitate to recommend it. This company seems relatively young, and, at present, we cannot find its main company website. However, with that stated, this company does offer other products that relate to health and well-being. They offer anti-wrinkle creams and lotions, and they even have a lash growth serum. With this newer product, however, they have officially entered the hair loss/growth market. THE SCIENCE OF 3HCTM STIMULATION COMPLEX – Blend of plant-derived active ingredients have been clinically shown to stimulate growth by promoting the proliferation of HFDPC cells, the stem cells responsible for regulating hair follicle development. It is clinically indicated to increase the number of growing fibers, increase follicle lifespan and prevent hair loss. In clinical trials of alopecia patients using dermatologist conducted pull tests (the clinical method used to estimate the amount of hair loss), the analysis showed a reduction in hair loss of 21% over a 3-week period. TURN ON YOUR DERMAL PAPILLA, THE HAIR ENGINE – 3HCTM is able to stimulate Human Follicle Dermal Papilla Cells (HFDPC), the stem cells that regulate hair follicle development. HFDPC are responsible for regulating hair length, thickness, and speed of growth. In just 48 hours after treatment with 3HCTM, hair showed a drastic increase of 71% in HFDPC cells. ANAGEN VS. TELOGEN HAIR – 3HCTM has the unique ability to increase the ratio of anagen (growth phase) to telogen (resting/dying phase) hair, which keeps follicles in a more constant state of growth. By keeping a larger percentage of hair in the growth phase and preventing hair from entering the resting phase, the body will continually encourage hair growth. After treatment with 3% 3HCTM a 31% increase in the anagen/telogen ratio was realized in just 60 days. THE SCIENCE OF AMINO KERA NPNF® – Combination of Keratin-derived amino acids designed for deeper penetration than other Keratin ingredients due to its molecular weight distribution. It has been clinically proven to provide immediate & long-term strengthening. In lab tests, hair treated with 2% Amino Kera NPNF® conditioner showed an immediate 10% increase in strength (defined as total work required to break hair) vs. placebo conditioner and a 41% increase after 3 applications. After comparing the listed ingredients to our key ingredient chart, here is how this product stacked up. This product does have a variety of base and essential oils, it has a number of hair follicle stimulants that both clean the hair and scalp and nourish hair, and it has DHT blockers. Another major plus, which isn’t even on our chart, is the fact that they state it is GMO-Free. This is important in that the use of pesticides of one of the major causes of concern for overall health and healthy hair. Unfortunately, this shampoo does use Sodium Laureth Sulfate (SLES). Although this is a milder form of Sodium Lauryl Sulfate (SLS), it is still a harsher detergent especially for those who shampoo daily and/or color their hair. SLS is known for stripping color faster, and many hair loss shampoos are eliminating these harsher detergents from their shampoos. While this shampoo has many beneficial ingredients, it has fallen just short of our “Best Shampoo” designation simply because it has SLS included in their ingredients and is considered to be just a little too harsh for daily use or for those who color their hair. If you do neither – you don’t shampoo every day and you don’t color your hair – this shampoo would get two thumbs up. 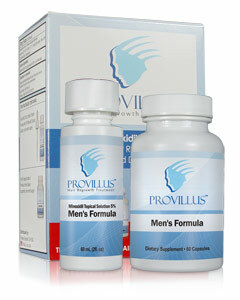 Minoxidil & FDA Approved. Free Trial too! "....documented proof this stuff works!" While I may be compensated for sales derived through this website, my opinions of these products are sincere and based on the first-hand experiences and reviews of real users I have uncovered through online research. Content provided on this site is for entertainment or informational purposes only and should not be construed as medical or health, safety, legal or financial advice.